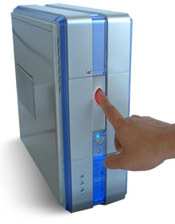 The following provides answers to many common questions regarding our Fingerprint Computer Systems. Please read this section before contacting us directly. If you have a question about something that is not covered here, please send us an email and your question might just end up on this page. Q: Do these computers work with our company's Windows network logon? A: Yes, our computer's fingerprint logon are compatible with or without network logon domain; but the fingerprint database for logon authentication are stored locally and not managed on the network server. A separate Enterprise software for network biometric fingerprint management will be available for company wide network management.